MOSCOW, February 14. /TASS/. 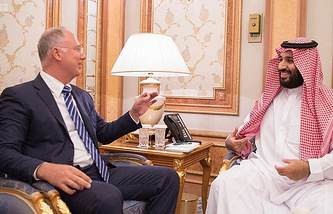 Chief Executive Officer of the Russian Direct Investment Fund (RDIF) Kirill Dmitriev discussed investment cooperation prospects with King of Saudi Arabia Salman bin Abdulaziz Al Saud, the RDIF press service said on Wednesday. "The King highly praised the significant progress in investment cooperation between Saudi Arabia and the Russian Federation. Material successes in investment cooperation between Russia and the Kingdom of Saudi Arabia were discussed at the meeting in particular, along with implementation of specific projects between the RDIF, the Public Investment Fund (PIF) and Saudi Aramco," the press service said. The RDIF and the PIF invested and approved investments totaling over $1.5 bln for the time being into such areas as petrochemicals, energy, logistics and transport infrastructure, retail, industrial production and real estate. The parties are also working on 23 projects in energy, producing, petrochemical, logistical, transport, agriculture, and technology sectors of the economy.